“Throughout the past 15 years, I have heard stories of and researched the fabled ‘Twiggy Macintosh’ computer,” Goolevitch told Cult of Mac in an email. “It was a thing of myth and legend — like a unicorn.”Locating these Macs was the first step, but getting them to work was the real challenge. Goolevitch and Franklin embarked on an all-out effort to resurrect these long-lost pieces of Macintosh history. The Twiggy Was Doomed, the Mac Was Not When the Macintosh was introduced by Apple on January 24, 1984, the diminutive all- in-one computer came with a 9-inch screen and a 3.5-inch floppy disk drive. Many of these revolutionary machines survive to this day. But before this Mac came a slightly different design that used the notoriously unreliable Twiggy floppy disk drive. Many of the disk drives didn’t work and manufacturing yields were low. These problems nearly derailed the Lisa, which began shipping to customers in June 1983 even though there were major problems with its twin-Twiggy configuration. The Mac was also supposed to use the Twiggy, but panic began to set in when everyone realized the dodgy disk drives just weren’t going to be reliable enough. Unlike the Lisa, the Mac didn’t have a hard drive to fall back on. After many tortuous rounds, even Steve Jobs finally acknowledged reality and gave up on the Twiggy drive. Apple had recently gotten a demo of a 3.5-inch disk drive from Sony. It worked at the same data rate as the Twiggy, and the disks it utilized had a hard plastic shell. When Jobs saw the drive, he loved it and immediately wanted to adapt it for the Mac. Of course that too was a tortuous process — see the Folklore.org story “Quick, Hide In This Closet!” for the entertaining details — but in the end, things worked out and the Mac shipped with the familiar 3.5-inch disk drive we all now know and love. Only a few Twiggy Mac prototypes were made. In true Jobsian fashion, all Mac prototypes at Apple that featured the failed floppy were ordered destroyed, and the Twiggy Mac was consigned to the dustbin of history. Until recently it was thought that none survived. A prototype Twiggy Mac (left) lies beside a final version of the Macintosh 128K. A Twiggy Mac Resurfaces The story ended there for nearly three decades. Then in January 2012 a Twiggy Mac resurfaced. Photos of the rare prototype were posted on Apple-centric website Apple- fritter and quickly started generating buzz. The owner of the mysterious machine, posting as “mactwiggy” and known publicly only as Jay, said at the time that he bought the system after seeing it advertised online. The elderly gentleman I purchased it off of is a retired engraver,” Jay wrote on Applefritter’s forums. The seller knew he had a highly collectible computer, but was willing to sell the piece at a less-than-maximum price to avoid dealing with potential buyers. “He was really just happy it was going to someone who knew what it was and would appreciate it,” Jay wrote. It was major find — truly a Mac collector’s dream. The interwebs were atwitter. To Goolevitch, a vintage Mac collector from British Columbia who had restored many Twiggy-based Lisas, this prototype proved irresistible. He contacted the owner and, after some negotiating, purchased the system. Goolevitch cleaned things up cosmetically and the system powered on, but he could not locate any Twiggy Mac software to boot or run the computer. With Apple-1 systems selling for hundreds of thousand dollars, he decided to try his luck on eBay. He listed the system for $100,000. “To my surprise, there was an overwhelming amount of media attention,” Goolevitch said. “Cult of Mac picked up the listing initially, stating that ‘it looks like Woz is clean- ing out his closet.’” Soon other media outlets, including Mashable, The Verge and The Huffington Post, were asking for interviews about the auction. Patent for Macintosh Computer Housing showing Twiggy floppy disk drive with Jobs, Manock and Oyama on the document. Meanwhile, news of Goolevitch’s Twiggy Mac was percolating worldwide, eventually reaching Franklin. A former Mac software developer, he had been president of Encore Systems, a company started by Randy Wigginton (Apple Employee No. 6), Ed Ruder (No. 29) and Don Breuner (no. 11). They created the program that would eventually become MacWrite. Now Franklin worked as a filmmaker. He also happened be the owner of a certain Apple relic left over from his time at Encore — a Twiggy Mac seemingly identical to the one making waves online. Franklin told his friends he was on location, and asked if one of them would contact Goolevitch about the Mac prototype that seemed to be just like the one he had squirreled away. “As far as I knew, my old prototype Twiggy Mac was still somewhere in storage,” Franklin said. “We each took turns picking from a huge pile of hardware,” he said. “My selection of the Twiggy and a Q-bert arcade game were not hot items of interest for any of us at this time. Between Goolevitch and Franklin, there were now two confirmed Twiggy Mac prototypes in the wild. Clearly, Apple did not have the same fastidious level of paranoid secrecy in 1984 as it does today. The seed had been planted for a Twiggy reunion. When Franklin returned to the United States, he contacted Goolevitch and the two quickly decided to collaborate on getting these old Macs working. This Twiggy Mac motherboard with custom ROMs (left) is similar to a Mac 128K motherboard. Working separately, Goolevitch could not get the disks from Franklin’s system to boot up his machine. They decided to get together and work on both systems simultaneously at Franklin’s home in California. They ran into predictable problems. “The ROMs in my machine were a different revision than his, as indicated by the num- bering scheme written on the stickers,” Goolevitch said. “Gabreal had indicated that new ROM and software revisions were at times turned over every few days or so back in that time. From that, I concluded that perhaps his ROMs and his software disks were compatible [only] with each other. I then swapped over his Twiggy disk drive and his ROMs into my machine and my motherboard. When the first Twiggy disk was introduced, to our amazement and surprise, the Twiggy Mac booted right up! This somewhat shocked both of us. It was now 2:30 a.m., and by this point both were exhausted. Goolevitch took a few photos to prove what they had done, and work continued the next day. Swapping chips a few at a time, they identified the problems with Franklin’s Twiggy Mac, and cannibalized replacement parts from a sacrificial Mac 512k. Then using the now-shared compatible set of ROMs, they got the second Twiggy working the next day. A bleary eyed Goolevitch (left) and Franklin with their pair of Twiggy Macs. Two Twiggies Live “As it would turn out, the Twiggy drive was faulty in my machine, and I needed to copy Gabreal’s motherboard ROMs,” Goolevitch said. “Gabreal was so kind as to allow me to borrow his Twiggy disk drive and ROMs in order to archive and duplicate them. "Drawing on the skills in the Lisa community helped get the second Twiggy Mac working"
The archiving of ROMs, controller chips, and Twiggy disks are very specialized tasks, perfected over the years by the folks in the vintage Lisa community. After all this time it’s nice to see an old Lisa helping out a Mac! (“In the interim, Daniel Kottke and I had tried to get my Twiggy running." Franklin said. "We had waited until James had 'cloned' my original disks, as it was a worry if the media was flakey. "We assembled the machine, put in the Twiggy drive and then it "became amusing." "It is far better to hear Daniel's side of the story, and the ground pin analysis," said Franklin. "Let's just say it was a challenging day. "The Twiggy was staying at Daniels'. I was off on a trip, and the chips for Adams machine were getting cloned," said Franklin. "When Daniel received the return package from James with the archived and duplicate chips, I came over. "We installed them into my Twiggy Macintosh, along with my working Twiggy disk drive back from Adam. A milestone had been reached. The Twiggy Mac had been reborn. Goolevitch and Franklin wanted to reveal their prized possessions to the world during an appropriate vintage Apple moment. The release of the Steve Jobs biopic film Jobs this Friday — which delves into the early years of Apple and brings to life the development of the Lisa and Macintosh computers — felt like that moment. “As a vintage Apple and Macintosh collector and hobbyist, this is, in my opinion, the greatest vintage Apple/Macintosh experience I have ever had,” Goolevitch said. “This would never have been possible without the help and friendship of Gabreal Franklin and James MacPhail. So will we see one of these working Twiggy Macs at Christie’s one day? Our collectors won’t say — right now they’re just busy basking in retro Mac glory. The dynamic duo plan to chronicle their continuing adventures at twiggymac.com. Bonus: Screenshots of Pre-Release Mac Software It’s only fitting that the oldest Macs in the world also run the oldest Mac software in the world. 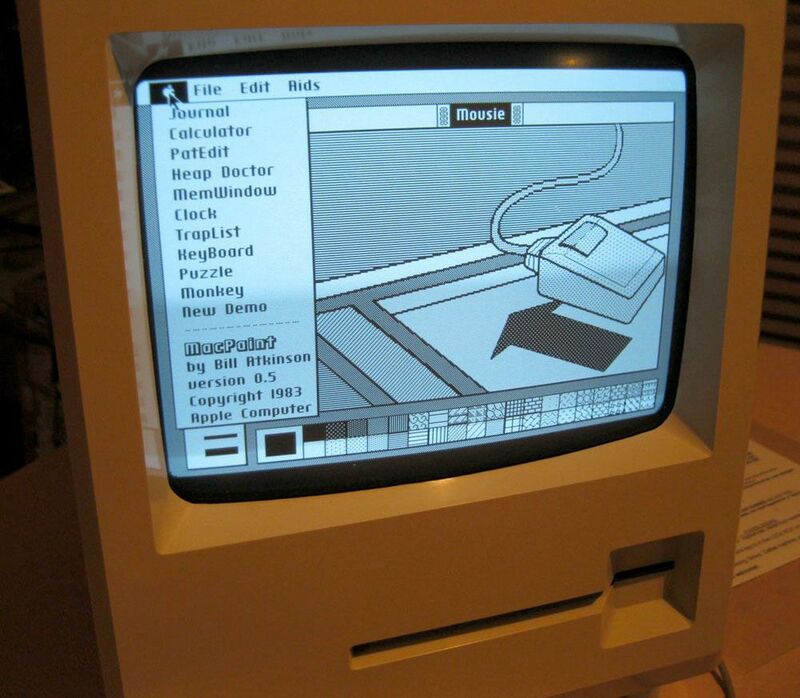 Here are some screenshots of pre-release versions of MacWrite, MacPaint and the Macintosh System Software. I love the “Steve sez” dialog boxes! Steve sez... A pre-release Mac System Software dialog box. MacPaint version 0.5 by Bill Atkinson. Randy Wigginton wrote MacAuthor, which became MacWrite. An early version of the Mac Finder. Do these icons represent frenzied developers? *This bracketed section has been added to the original article.